The flight of a blackbird across the lough, a flight up to the stars, longing for solitude, longing for a lover, thanks for the wild winds, contemplation of the winds of God that put fire in the head, the gentle companionship of a quiet cat: all these make their way into Songs of the Scribe. . The writers were the people who created the illuminated manuscripts of medieval Europe, the Book of Kells and its companions. These poems and and fragments and reflections come from Ireland, where most of this work was done in medieval times -- that idea of Ireland as a land of saints and scholars goes back a long way -- and they are some of the first bits of personal poetry in Ireland. 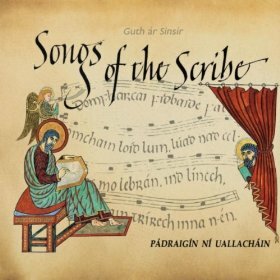 Pádraigín Ní Uallacháin, musician and scholar, has taken these texts as inspiration and substance for a series of contemplative songs, ones that evoke the stillness and focus, the history and the lives of this ancient time. They invite you in to “a world of woods, water, and birdsong, lamentation and the divine, mystical incantation and love songs,” she says. So they do. There are ten pieces in all, all sung in Irish. The Hermit’s Wish is, as one might suspect from the title, one for solitude, to be alone with God. Liadan’s Lament longs for a lost lover, while Land of the Stars tells of a legend of love fulfilled and a flight to the stars in celebration. The quieter world of ancient times comes through as The Blackbird of Belfast Lough takes flight, while The Incantation of Amergin holds echoes of older times in its prayers of Christian faith. There’s the fire and wind of God spoken of in that one. In The Wind is Wild Tonight, the writer gives thanks for winds for a reason perhaps less mystical -- the wild winds of an Irish winter are about, and that means Viking raiders will not be sailing. Ní Uallacháin’s voice is backed by her own touch on drones and bells with harps, monochords, and Tibetan bowl from Helen Davies. These spare arrangements well suit the songs. Contemplative they are, indeed, but distant, not at all. In Ní Uallacháin’s hands, it’s a world both present and ancient. That’s a dichotomy which will resonate with anyone who has ever spent a night of wild winds or crisp clear morning in Ireland. The liner notes add to the music, with Irish lyrics and English translations, some of Ní Uallacháin’s thoughts on each song and bits about the history of the text, and photographs and images which enhance these ideas. This sounds amazingly intriguing. Definitely must have a listen. What a beautiful and poetic description. I like to listen, but I'm afraid that my listening is not as discerning as you. You are such a great guide to "getting" the intent of the musicians. The album cover is in and of itself art - lovely. Your description made me want to visit Ireland! This sounds amazing. I just love the concept so much. This sounds wonderful and I love the album cover too! Now I'm going to be obsessed with black birds the rest of the day. We woke up to some noisy ones this morning. They stay year-round here, so it was snowing like MAD this morning, but the birds were singing. One of my favorite aspects of medieval history is the illuminated manuscripts. When I was writing my book, I'd get so caught up in the idea of someone handwriting a beautiful book. The idea of these texts as music is very appealing to me!